Conservatives are continuing on in their venture of shamelessness and stupidity, debating over the next presidential nominees that have been handpicked. Furthermore, in many cases, their records have proven them to be corrupt and ineligible. Yet, all of this is overlooked by those who should know better. They go on as if to ignore the crimes that have been committed or as if it is the norm for representatives to violate their own oaths and transgress the law. I ask you, are the conservatives talking about bringing Hilary Clinton to justice? Or are they talking about her chances of becoming the first woman president? How about Jeb Bush? There is no difference between him and what America is complaining about concerning the current administration. Or what of Rand Paul, the libertarian (without regard to the law), who wants to appease both the sodomites that want to marry along with traditional marriage? Rand seems to believe that man created government and that he has a right to erect a government in his own image. It is as if The Lord is saying to America, "You set up Kings, but not by Me" (Hosea 8:4). The conservatives get the American people talking about the wrong issues, then, they get the same results. All the while, the American people are trying to figure out why they are confused (Daniel 9:7). This process is insanity: Doing the same things and getting the same results - while expecting different results (Hosea 8:7). These are the same people who have helped turn America's glory into shame because they have left off knowledge and common sense. Do you want resolve? Well, desperate times call for desperate measures. Bring forth judgment (Amos 5:24)! 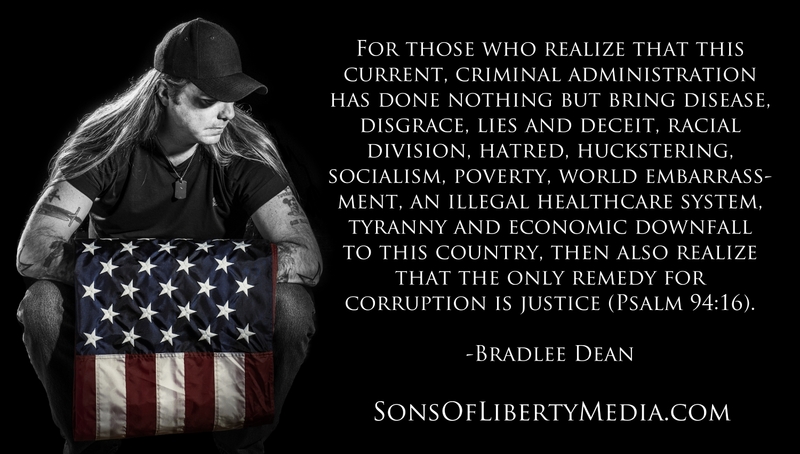 For those who realize that this current, criminal administration has done nothing but bring disease, disgrace, lies and deceit, racial division, hatred, huckstering, socialism, poverty, world embarrassment, an illegal healthcare system, tyranny and economic downfall to this country, then also realize that the only remedy for corruption is justice (Psalm 94:16). America needs to realize that across this nation, we are all saying the same things because we are all rooted in the same principles (Hosea 4). Shut the mainstream programming off, especially the conservatives, for they, along with their viewers, are responsible for painting America into a corner. Yes, there is. The hope is found in what you do with the truth that has been given to you (Colossians 1:27). Do all that you can do and leave the results up to God. But you first have to do. There is a story told of a mule that fell into a well. As it sat in the pit of that well, it whined and whined until it could whine no more. During that time, one of the farmers heard the mule, came over and noticed that it fell into that well and knew that if he did not get it out, it would soon die. So, the farmer gathered some of the local farmers to see how they could get the mule out. Without any lengthy debate, they just decided to leave that mule to die in the pit of that well. It was worthless, or so they thought. Each of the farmers went back to their farms to get their shovels, headed over to the well and started to scoop the dirt to bury the mule. With each scoop of dirt that was thrown into the well, it would land on the back of the mule. In desperation, with each scoop of dirt that was meant to bury him, he would simply shake it off and use the dirt that fell from his back as a stepping stone to trot right out of that hole that they meant to bury him in. To those who are shaking it off and are in the good fight of faith (1 Timothy 6:12; James 2:18), to those who are bringing forth a labor of love (1 Thessalonians 1:3), to those who are bringing forth Judgment to establish righteousness (Isaiah 26: 9), and have come to the realization that we are overcoming this world (1 John 5:4) and are made more than conquerors through Him that loved us (Romans 8:37) and continue to stand in this warfare (Ephesians 6:12), I salute you. Remember, God does not need a majority to prevail just an obedient minority (1 Corinthians 1:29). God is willing to give to His church what they are willing to fight for. Re: Don't Put Your Hope in "Conservatives"
Conservatism is the half of the mind-body dichotomy that, primarily, seeks to control thought and to allow physical freedom. Liberalism is the half of the mind-body dichotomy that, primarily, seeks to control physical actions and to let thought run free. Neither one of these two ideologies is fundamentally different from the other. BOTH are based on fictitious contradictions, the SAME contradiction: That the human mind and the human body are separate entities. A mind without a body is a ghost and a body without a mind is a corpse, both rightfully relegated to the realm of the dead. Of course, Bradlee Dean has NO problem with this as he thinks his imaginary friends are real and he ignores anything that indicates this that contradicts the evidence of his senses.